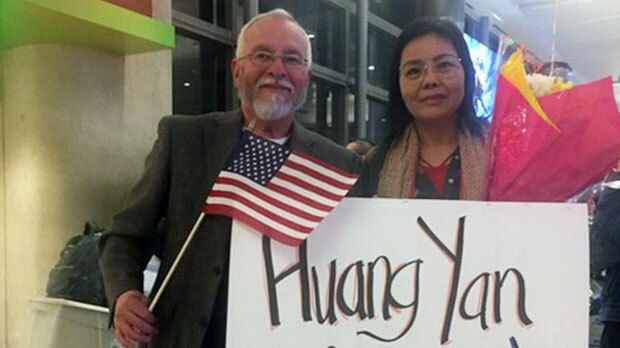 Chinese rights activist Huang Yan, a former torture victim who spoke out publicly in support of rights lawyer Gao Zhisheng, arrived in the United States on Friday after being granted political asylum. Chinese human rights activist Huang Yan upon arrival in Los Angeles, Jan. 25, 2019. Huang had previously applied for asylum in Taiwan after abandoning a flight from Jakarta to Beijing during its stopover on the democratic island last June. Instead, the authorities granted her temporary leave to remain, and she continued to apply for refugee status in a third country. “I would like to extend my heartfelt thanks and gratitude to everyone who helped me in Taiwan,” Huang said on arriving at Los Angeles. Huang fled China after years of harassment, repeated incarceration, and torture at the hands of the mainland Chinese authorities linked to her rights activism. Her escape to Thailand from the former British colony of Hong Kong, which runs a separate immigration border from mainland China, was assisted by Bob Fu, president of U.S.-based Christian rights group China Aid, and culminated in her being recognized as a genuine refugee by the United Nations High Commissioner for Refugees (UNHCR). But a number of Chinese refugees have been repatriated to face further punishment by the Thai authorities in recent years, and Huang boarded a plane to Taiwan in the hope of evading capture. According to a 2011 statement by detained rights lawyer Gao Zhisheng, Huang was kidnapped and imprisoned with members of the banned Falun Gong spiritual movement, where she suffered repeated torture. In November 2015, the United Nations Committee against Torture (CAT) said torture and ill-treatment remain “deeply entrenched” in China’s law-enforcement and criminal justice systems. “China is a huge country with a population of 1.4 billion, but oppression and persecution have gotten even more serious in recent years under the absolute power wielded by [President] Xi Jinping,” Huang said. “Back in China, I basically was followed every minute of the day and [often] kidnapped [by police],” she said. Yang Sen-hong, president of the Taiwan Association for China Human Rights, said the decision to grant Huang political asylum came after a grueling effort to provide evidence of the abuses that she had suffered at the hands of the ruling Chinese Communist Party. “I can only say that we had to go back to China, to Thailand and even Jakarta to obtained detailed evidence that was repeatedly asked for by the relevant authorities,” Yang told RFA. He said being recognized as a refugee by UNHCR is only the first step in a long and tortuous road to political asylum, however. “If anyone imagines that they can just get on a plane to Taiwan with their UNHCR refugee document, then go to the U.S., that’s not what happened with Huang Yan,” Yang said. “The Taiwan government isn’t obliged to welcome everyone who has been similarly treated,” he said. Taiwan’s government, officially known as the Republic of China dating back to the 1911 revolution under Sun Yat-sen, is typically reluctant to be seen as a safe haven for Chinese dissidents fleeing persecution across the Taiwan Strait. Chen Ming-tong, spokesman for Taiwan’s Mainland Affairs Council (MAC), said the government had offered a 90-day stay to Huang in the hope that she could sort out her application during that time. “We assessed the situation from every angle, but human rights weighed the most heavily,” he said. Meanwhile, Chinese asylum-seekers Yan Kefen and Liu Xinglian, who also abandoned a China-bound flight at Taipei, have been camping out in the Taoyuan International Airport for nearly four months while the authorities consider their applications. The MAC said on Thursday it has approved their entry to Taiwan on principle on a “professional exchange” visa, but that they will have to travel to a third country and re-enter Taiwan before being allowed in. Taiwan has a tense relationship with the Chinese Communist Party (CCP), which regards the island as a renegade province awaiting “unification,” despite never having ruled the island. President Tsai Ing-wen rejected calls from Chinese President Xi Jinping earlier this month to move towards “unification” with the People’s Republic, saying its people have no wish to give up their sovereignty. In a Jan. 2 “Letter to our Taiwan compatriots,” Xi was insistent that China must be “unified,” saying that China would make no promises not to use military force to take the island. But a recent opinion poll found that more than 80 percent of Taiwanese would reject Xi’s offer to rule the island via the “one country, two systems” model used for the former colonies of Hong Kong and Macau. Taiwan was ruled as a Japanese colony in the 50 years prior to the end of World War II, but was handed back to the 1911 Republic of China under the Kuomintang (KMT) government as part of Tokyo’s post-war reparation deal. The island began a transition to democracy following the death of Chiang Kai-shek’s son, President Chiang Ching-kuo, in January 1988, starting with direct elections to the legislature in the early 1990s and culminating in the first direct election of a president, Lee Teng-hui, in 1996.